Measures current, average current, and accumulated current. DALLAS Semiconductor has introduced the DS2756, a high-precision battery fuel gauge that integrates precise current, voltage, and temperature measurements along with nonvolatile data storage into one IC. Available through Arrow Electronics , the DS2756 contains three power states, including active, sleep, and a unique 'suspend' mode. Suspend mode allows the DS2756 to optimise its own current drain while other devices in the host enter low-power inactive states. Suspend mode thus extends the battery and operational life of the host product. Using suspend mode, the DS2756 remains in an ultra-low power state while the host product is in a low-power operative state, such as standby. The DS2756 periodically cycles between suspend mode and active mode to measure current at a reduced supply as low as 10 microamps. Cycling between these power states lets the DS2756 detect if the pack is being discharged or charged above programmable low-current suspend thresholds. If the DS2756 detects either of these conditions, it sends a microcontroller or other pack circuitry a wake-up alert to begin normal active operation. The DS2756 measures current, average current, and accumulated current. 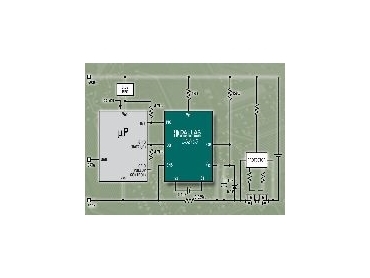 Using a 20mW sense resistor, current accumulation is performed over a range of ±3.2A. An external filtering capacitor allows peak currents of higher values to be integrated in the current-accumulation (fuel-gauging) measurement. Accumulated current is reported with an accuracy of ±2% of reading, ±3.9 microvolts over a range of ±64mV. Standby currents are measured with an accuracy of ±195 microamps. Voltage is measured over a 0 to 4.75V range with a resolution of 4.88mV. Temperature is measured over the entire operating range with a resolution of 0.125 degrees Celsius. If either the accumulated current or the temperature measurement exceeds user-programmed limits, the DS2756 sends an interrupt to the host processor to indicate that the event has occurred. A unique 'snapshot' mode allows both current and voltage measurements to be synchronised, so the DS2756 can obtain an instantaneous power measurement for a specific single event. All measured data is stored in on-chip EEPROM or SRAM memory, and can reported to the host through the D2756's 1-Wire communication interface. Typical applications for the DS2756 include handheld wireless products such as multimedia players, mobile phones, PDAs, and digital cameras. The device is available in a tiny 8-pin TSSOP package, small enough to easily fit on the side of a Li+ prismatic cell and thus, ideal for battery packs.